This Is The 320-HP 1-Series Europeans Are Buying. 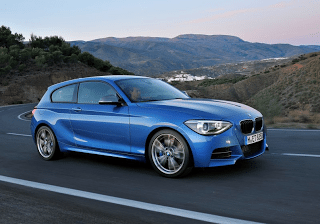 The M135i Is Priced Like A 328i. After a May surge, Ford dealers couldn’t have had nearly as many Mustangs to sell in June 2013. Year-over-year, sales fell 23%. From May, June Mustang volume slid 48%. The Mustang, Chevrolet Camaro, and Dodge Challenger accounted for 0.65% of the Canadian auto industry’s first-half volume in 2013. The same three cars are much more popular in their home market. (Mind you, the Camaro and Challenger are assembled in Canada.) The trio accounts for 1.48% of the U.S. market’s 2013 sales. 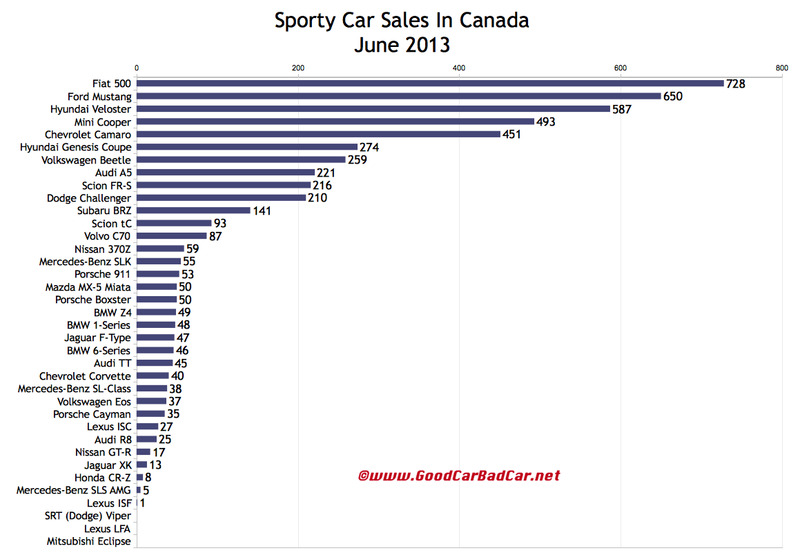 Jaguar F-Type sales shot up to 47 units in June, the newest Jag’s second month on sale in Canada. Audi didn’t sell that many TTs, nor did Porsche sell that many Caymans. BMW, Mercedes-Benz, and Porsche did sell more Z4s, SLKs, Boxsters, and 911s. But not many more. Subaru reported its best BRZ sales month yet. Its twin, the Scion FR-S, was down 47% in June, but it’s still a much more common product than the BRZ. You can click any model name in the tables below to find historical monthly and yearly Canadian sales data. You can also select a make and model at GCBC’s Sales Stats page. These tables are now sortable, so you can rank sports cars, muscle cars, roadsters, and coupes any which way you like. Suggestions on how GCBC should break down segments can be passed on through the Contact page.